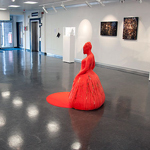 There is a wide range of facilities at Kingston School of Art, where this course is based. Kingston School of Art at Knights Park is our art, design and architecture campus and is situated on the Hogsmill River, with its restaurant and bar opening on to the waterside. Find out more about the Kingston School of Art Knights Park. Our specialist support and technical staff will help you get the most from our facilities. 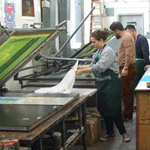 Find out more about our studios and workshops in the Kingston School of Art at Knights Park. The learning resources centre (LRC) at Kingston School of Art is the perfect place to study. It has specialist book and journal collections, a wide range of electronic resources, including image databases, and a large slide collection. Find out more about the learning resources centre at Kingston School of Art at Knights Park. Kingston is just a 30 minute train journey away from central London. Here you can access a wealth of exhibitions, museums and galleries, including the V&A Museum, the Tate Modern and the Natural History Museum.